Intelligence is a complex concept. Gardner proposed a theory of multiple inteliigences in the aim to define 8 types of intelligences. A person will always posses every one of the eight intelligences but in varying amounts. Each person will have their own unique intelligence profile. Traditionally IQ has always been thought to be very important to achieve success in life. However not all intelligent people are successful. 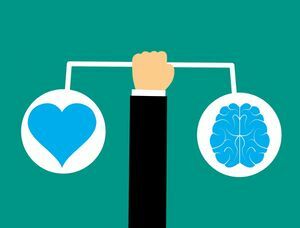 Emotional intelligence is a key factor that contributes to success in not only the workplace but also in social relationships and life in general. The 3 main contributors to the Emotional Intelligence body of research have been Salovey and Mayer, Goleman and Bar-On. Each has developed their own conceptual framework of Emotional Intelligence as discussed below. Salovey and Mayer view EQ as something you are born with. They believe that people can improve their EQ but it is limited to the amount of EQ they innately have. Goleman’s model was developed using a compilation of others research. It has not been researched rigorously in scientific circles, but he is widely published, and his work is very easily understood by lay people. Reuven Bar-On developed his framework, The Bar-On Model of Emotional-Social Intelligence, which was recently updated in 2011. It is by far the most widely researched and utilized framework within Emotional Intelligence circles. His framework contains 5 composites with 3 subscales within each composite. It is important to note that the ideal is to be balanced within each subscale and not necessarily high in every one. Being very high or very low in a specific subscale can lead to dysfunctional behaviour. The 2 most widely used tools to measure EQ are the MSCEIT and the EQ-i 2.0. Based on the Mayer and Saloveys work this test is quite similar to an IQ test with specific measures and right and wrong answers. There are some limitations with this test in how the developers obtained the “right” answers. They used standard populations and the debate is, in research about emotions, can be right and wrong answers. The test is designed to measure ones innate or inborn EQ and as such can indicate someone’s ability to learn EQ skills. 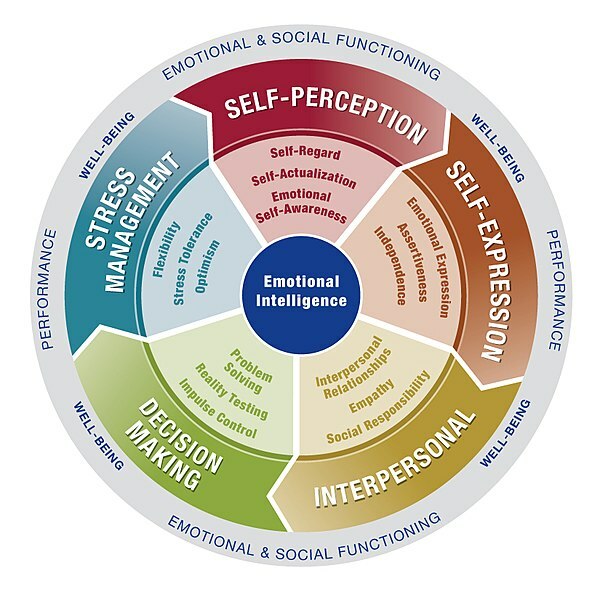 Based on Bar-On’s Model of Emotional-Social Intelligence, the EQi 2.0, is probably the most used EQ measure. The EQ-i 2.0 is a self-report measure and the EQ 360 2.0 is a full assessment that looks at how others perceive oneself. After completing the EQi 2.0 a report is generated that indicates areas of strengths and weaknesses within each of the 15 skills of Bar-On's model that can then be addressed. They need to be constructed using a specific, clear and well documented conceptual framework (such as the Bar-On Emotional-Social Intelligence Model). ↑ 2.00 2.01 2.02 2.03 2.04 2.05 2.06 2.07 2.08 2.09 2.10 Ackley D. Emotional intelligence: A practical review of models, measures, and applications. Consulting Psychology Journal: Practice and Research. 2016 Dec;68(4):269. ↑ 4.0 4.1 4.2 Kotsou I, Mikolajczak M, Heeren A, Grégoire J, Leys C. Improving emotional intelligence: a systematic review of existing work and future challenges. Emotion Review. 2018:1754073917735902. ↑ Vlachou EM, Damigos D, Lyrakos G, Chanopoulos K, Kosmidis G, Karavis M. The relationship between burnout syndrome and emotional intelligence in healthcare professionals. Health Science Journal. 2016;10(5):1. ↑ Codier E, Codier DD. Could emotional intelligence make patients safer?. AJN The American Journal of Nursing. 2017 Jul 1;117(7):58-62. ↑ Emanuel EJ, Gudbranson E. Does medicine overemphasize IQ?. Jama. 2018 Feb 20;319(7):651-2. ↑ Bar-On R. The impact of emotional intelligence on subjective well-being. Perspectives in Education. 2005 Jun 1;23(1):41-62. ↑ Karahan TF, YALÇIN BM. The effects of an emotional intelligence skills training program on anxiety, burnout and glycemic control in type 2 diabetes mellitus patients. Turkiye Klinikleri Journal of Medical Sciences. 2009;29(1):16-24.